In 2009 has been produced yacht Dufour 455 Grand Large named Cara Mia. She is based in harbor Murter in area of Sibenik in Croatia. 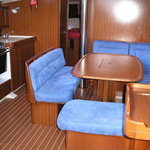 You can take in up to 10 persons on the sailboat Cara Mia. Layout of beds is 10 (8+2). There are 4 cabins located under boat's deck. Cara Mia has 2 WC with showers. You can see other vessels by clicking on this link: Yacht charter Sibenik. 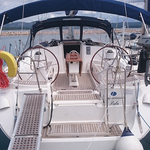 Fuel tank is 250.00 l liters big , water container has up to 530.00 l l. In this sailboat is applied motor 75 hp. 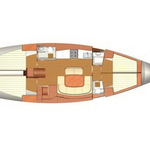 With 13.76 m of lenght and 4.30 m of beam Cara Mia offers enough space for comfortable sailing. 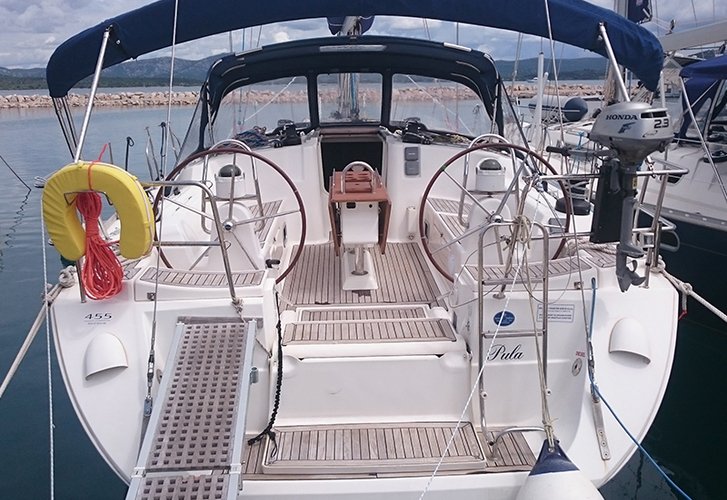 Dufour 455 Grand Large Cara Mia is equipped with: Mainsail with lazy jack, 2 refrigerators, Autopilot, Gps plotter, Bimini top, Dinghy, Anchor electric windlass, Outboard engine. . Security caution is 2500.00 EUR. Analyze different boats here: Yacht charter Murter.